WASHINGTON — The organization that runs the portion of the International Space Station designated a U.S. national laboratory hopes that a change in branding will increase the awareness, and utilization, of the facility. The organization formally known as the Center for the Advancement of Science in Space (CASIS), a non-profit that since 2011 has been responsible for utilizing ISS facilities and resources designated by Congress as a national laboratory, has in recent months quietly changed its public name to the ISS U.S. National Laboratory. That includes changes to its website, social media and press releases, none of which now refer to the organization as CASIS. Joseph Vockley, who became president and executive director of CASIS in July 2018, said at the organization’s annual public board meeting here Feb. 8 that the change in branding is part of an effort to raise awareness about the lab itself in an effort to attract more users. “I began to wonder if it wasn’t a reasonable thing to do to better inform people, to help them understand our function” with a name change, he continued. “It’s a much clearer message to them.” He didn’t discuss the approach the organization used to quietly change its name. Vockley said later in the meeting that the change in branding doesn’t extend to the organization’s legal name. “CASIS is our official name. It will always be our official name, as far as I know. We have no intention doing anything else,” he said. NASA Watch reported in January that CASIS had filed fictitious name registrations, also known as “doing business as” or DBAs, to allow it to use the name “ISS National Laboratory.” Vockley himself referred to the organization as CASIS several times during his presentation at the board meeting. Utilization of the resources set aside on the ISS for the national laboratory has long been an issue. 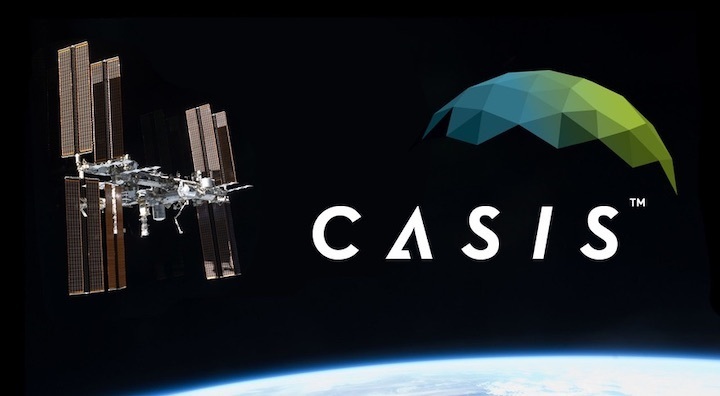 While CASIS emphasized at the meeting some of the success stories regarding research done on the station, particularly in biotechnology, CASIS has struggled to make full use of the resources provided to it by NASA. CASIS didn’t provide full details about its resource usage at the meeting or in its annual report, but acknowledged that it has fallen short of full usage. “Optimization of resource use is dependent on the given availability of all supply chain resources, including frequency of launch vehicles, ascent flight resources, and facilities,” it noted in a list of frequently asked questions distributed at the meeting. It boasted increases in both upmass, or cargo transported to the station, and downmass, or cargo returned to Earth, as well as crew time usage that, in 2017, exceeded its allocation. CASIS said that it estimates that, based on payloads on or scheduled to go to the station, it will use 95 percent of its crew time allocation in the first half of 2019, and 92 percent of commercial facilities it has access to there, such as experiment platforms. He added that the uncertainty about the station’s long-term future has not been a factor in attracting or deterring potential users. While the Trump administration announced plans, in the fiscal year 2019 budget request for NASA, to end direct federal funding for the ISS in 2025, there’s been opposition to that deadline in Congress, including proposals to extend the station’s authorization to 2030. “It has not impacted us yet,” he said of that uncertainty. “I think that, as we get clarity from the various government agencies who have the decision-making power on when the space station will be decommissioned as a national laboratory, we would look at our research portfolio and have to make decisions about our funding.” No such decisions, he added, have been made, nor are anticipated to be made for the foreseeable future. “NASA is going to tell us when they’re going to stop sending rockets to the station,” he added, “so we’ll know very clearly when we can no longer send payloads.